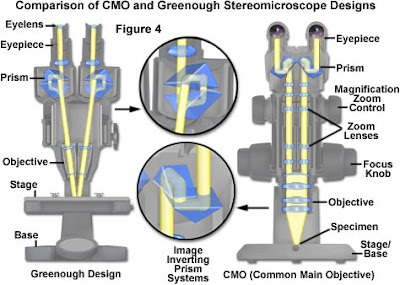 There are two types of optical systems created in stereo microscopes: the Greenough optical system and the Common Main Objective (CMO) optical system. The Greenough design, introduced by Zeiss at the turn of the twentieth century, consists of two identical (and symmetrical) optical systems each containing a separate eyepiece and objective arranged in accurate alignment with a single housing. This design allows high numerical apertures because the objectives are very similar to those used in compound microscopes. The lower section of the microscope contains the objectives, while the upper end of the body tubes project an image to the eyes. Image courtesy of MicroscopyU - shows the difference in Greenough and CMO designs. You can view Greenough stereo microscopes here. Common Main Objective stereo microscopes have more light-gathering power than the Greenough design and are often corrected more for optical aberration. The greatest design feature and practical advantage of a CMO stereo microscope is the infinity optical system that allows for effortless introduction of accessories such as beamsplitters, drawing tubes, coaxial episcopic illuminators, etc. It is also possible to place these items in between the objective and the zoom body, whereas in the Greenough design this is not an option. 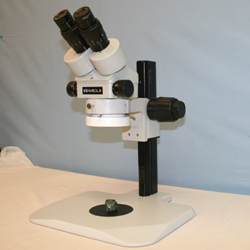 You can view Common Main Objective stereo microscopes here. Greenough stereo microscopes are typically used for everyday applications such as printed circuit board inspection, dissection of biological specimens, or any routine tasks. 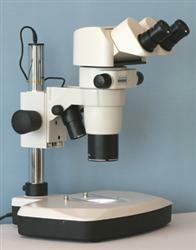 The lower price of a Greenough microscope along with its ruggedness make it easy to use and maintain. CMO stereo microscopes are typically used for more complex applications that require high resolutions and advanced optical and illumination accessories. CMO systems can cost twice as much as Greenough stereo microscopes due to the complex nature in design of the system.